Applicants completing Environmental Compliance Approval (ECA) applications should consult the Ministry of Environment document Guide to Applying for an Environmental Compliance Approval. The purpose of this web-page is to help ECA applicants retrieve the information needed to complete Section 4.5 of the application. This section of the application is concerned with Source Protection Drinking Water Threats within the Niagara Peninsula Source Protection Area. 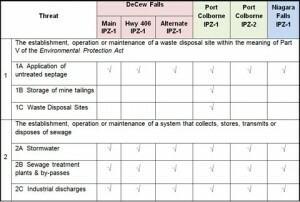 To identify if your sewage or waste disposal activity is located in a vulnerable area within the Niagara Peninsula Source Protection Area, please see the Watershed Explorer mapping tool. Please note there are no municipal wellhead protection areas in the Niagara Peninsula Source Protection Area. 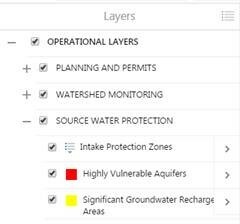 The surface water intake protection zones, highly vulnerable aquifers and significant groundwater recharge areas are available under the tab Operational Layers/Source Protection (see adjacent screenshot). To determine if your sewage or waste disposal activity classifies as a significant drinking water threat in the Niagara Peninsula Source Protection Area please see the table below and the associated schedules (DC1, DC2, DC3, PC1, PC2 and NF1) of the Niagara Peninsula Proposed Source Protection Plan. For more information on the specific criteria making these activities significant drinking water threats can be found in the Niagara Peninsula Source Protection Area Assessment Report Appendices.